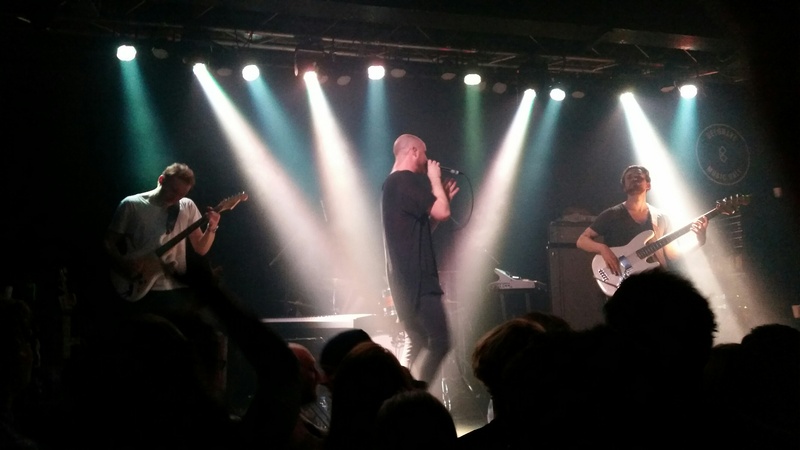 Witnessing Lost Ground, Cleft and the incredible Agent Fresco at Belgrave Music Hall in Leeds on Sunday evening was akin to witnessing the destruction of all the hoary old myths surrounding technical and progressive music in one fell swoop. Even today, assessors of the scene still occasionally trot out cliché-ridden, by-numbers reviews of music that is damned faintly as too cerebral, too serious, too outré, too cold; a conclusion that is, certainly on tonight’s evidence, ridiculously wide of the mark. Yorkshire trio Lost Ground delivers an emotive set of alternative math rock to an appreciative audience. Sublime chord progressions, propulsive grooves, wigged out time signatures and hearts on sleeves are the order of the day. An increased stage presence would, to these eyes and ears, take the band to the next level, but it’s a very minor quibble and James Akbar’s fluid drumming particularly impresses. Cleft describe themselves as making 2-piece turbonoise speed-prog. The description is spot-on. Theirs is an electric brand of high energy, mind-bending rock n’ roll, featuring judicious use of loops and samples to flesh out their sound and sustain atmospheric interludes in amongst the calliope-tech-rock. Importantly, the duo’s set is also cut through with massive amounts of humour. Taking their music seriously, the pair never take themselves seriously, and it’s a joy to behold. And so to tonight’s headliners, Iceland’s Agent Fresco. Following the band’s critically lauded 2010 LP, A Long Time Listening, and the release of this year’s stunning follow up, Destrier – described by an enamoured fan in the front row of the Belgrave crowd, entirely accurately, as ‘outrageously good’ – it’s difficult to understand how Agent Fresco don’t have a higher profile in the UK. This show is, in fact, their UK headline debut following a stripped back acoustic set at this year’s TechFest. Nevertheless, on a freezing cold Sunday evening in Yorkshire, the band have enough good-standing to draw a couple of hundred people out in to the winter night to witness a consummate performance of some of the most fearless, defiant and emotionally cathartic rock music you’re likely to hear all year. Agent Fresco really are a band that defy categorisation, the ‘progressive’ tag somehow not truly managing to encompass the elements of pop, rock, metal, electronic and classical music that they successfully incorporate into their inspired and inspiring music. However you label them, frontman Arnór Dan Arnarson is quickly able to simultaneously lose himself in his committed and emotional performance and yet still manage to take the rest of us with him. Stalking the stage with an excitable and nervous energy, he switches almost effortlessly between passages of delicate vocal prowess and a full on metallic scream as the mix of material from A Long Time Listening and Destrier demand. His bandmates are equally impressive, Vignir Rafn Hilmarsson at times throwing his bass around like a trident, thrusting and slashing as if at an imaginary adversary that he plans to strike down with the power of music, and Hrafnkell Örn Guðjónsson beats on his drums as if his very life depended upon it. Only Þórarinn Guðnason gives a less immediately kinetic performance, and yet somehow is no less powerful for it, his relative stillness managing to convey a preternatural strength, like a still pond that nevertheless runs spectacularly deep. Arnór Dan frequently takes time between performances to help the audience understand the context of key songs such as “A Long Time Listening”, “Wait For Me”, “See Hell”, and “Dark Water”, recalling his state of mind at the time of each song’s writing with eloquence, insight and good humour. It adds an additional layer of connection and understanding between band and gig-goer alike. After an extraordinary, solid hour and a half of this spellbinding spectacle, the vocalist and songwriter takes time out to thank the crowd profusely and namecheck some of the key members of crew who have finally managed to bring Agent Fresco to the UK. He and the band’s gratitude are palpable, and the sweaty, smiling crowd – some of whom have been singing and screaming every syllable back to the stage – seem equally appreciative. That recent album Destrier is essentially the sound of a man navigating his emotional response to being the victim of an act of physical violence (the album draws specifically upon Arnór Dan Arnarson’s assault that left him bloodied, battered and with a broken eye socket) seems entirely fitting in these troubled times. That the experience of witnessing this incredible band live should prove to be as powerful and cathartic for the audience as it might have been for Agent Fresco in making said album seems only just. It may be the band’s first real foray in to the UK, but based on this remarkably fine performance, it certainly won’t be their last. Read our recent interview with Agent Fresco’s frontman Arnór Dan Arnarson here. Finally a band that really means what they are doing!